Ornamental grasses add texture to the landscape with muted plumage and simple foliage. Gardeners include these plants in the home landscape for their beauty as well as their low maintenance needs. Cutting back ornamental grass differs by the height of the plant. 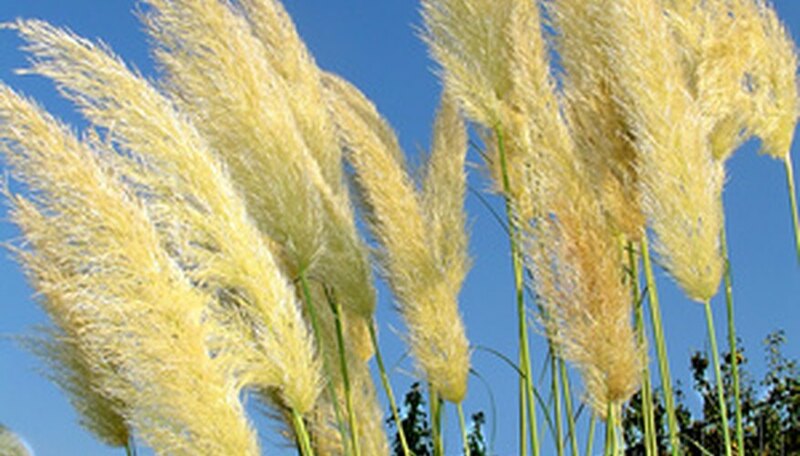 Low-lying clumps require the use of different tools and techniques than towering masses of pampas grass. Schedule pruning for late spring before new shoots appear around the base of the ornamental grass. If you're a little late, don't worry. Just avoid clipping the tips of new shoots. Wear protective clothing and gloves to limit cuts on your hands. Grass blades, especially dried ones, can be very sharp. Tie a length of twine completely around the clump of grass close to the ground. Tie it off and gently slide the twine midway up the stalks. Select long handled hedge shears as the first tool to prune the plant. Cut below the twine level to remove old growth, making sure not to snip off the tops of any new growth. Tidy up the length with hand-held pruning shears to create a uniform clump of grass. Pull off the length of twine. Remove clippings from the garden bed and dispose of them in the compost pile or yard waste bags. Reach into the center of the grass clump and remove dead foliage to encourage new growth in the center. Time the pruning session for late spring before major new growth appears. Tie twine around the base of the plant, collecting as many stems and leaves as possible into this lower level of twine. Tie a second piece of twine halfway up the plant to make for easy transport of clippings. Use hedge clippers to cut back less dense clumps of ornamental grass. Leave about 6 to 8 inches of old growth with each cut. Thick masses of dense grass blades require the use of electric hedge clippers or a chain saw to make an even cut through the ornamental grass. Wear protective gear when using this type of motorized equipment. Remove all clippings and twine from the plant and garden bed. You should be able to easily lift the larger bunches of grass using the twine as a handle. Reach into the interior of the grass clump to strip out older foliage. Opening up the center of the plant promotes thick interior growth.